A hotel room is so much more than just a place to rest your head – it’s your home away from home. 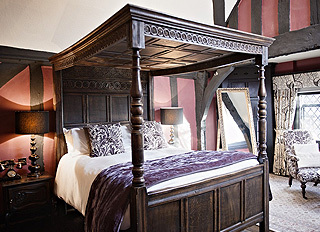 So at Fuller’s hotels and inns, our beautiful bedrooms are designed to make you feel happy, comfortable and relaxed. Whether you’re staying in one of our historic London locations or enjoying a quiet countryside retreat, you’ll open the door to cosy comfort, charming character and stylish finishing touches. There’s free Wi-Fi and complimentary tea and coffee to enjoy, and all of bedrooms have luxurious 1600 spring mattresses dressed in the finest Egyptian Cotton Linen. Fuller’s hotels aren’t about living out of a suitcase, that’s why we provide you with fresh milk not long-life and in many of our rooms you’ll find Nespresso machines and a bottle of Fuller’s beer to make you feel right at home. From rooftop rooms in London with stunning private terraces, to four-poster boutique bedrooms with views over open country, our accommodation is wonderfully varied. Right across our collection of hotels and inns, you’ll find rooms of individual character - many designed and furnished with entirely bespoke decor for a unique and stylish stay. All our rooms share a few important things in common though. Each promises a comfortable night’s rest), a flat screen TV, a private en suite bathroom – and of course, the opportunity of a nightcap nearby.